The judiciary may appear the only functional branch of the federal government, but a string of recent rulings have contributed to the impending catastrophe on Capitol Hill. By a strange coincidence, the Supreme Court's October Term may begin just as the rest of the government collapses. The Court, however, will assemble with a swagger. 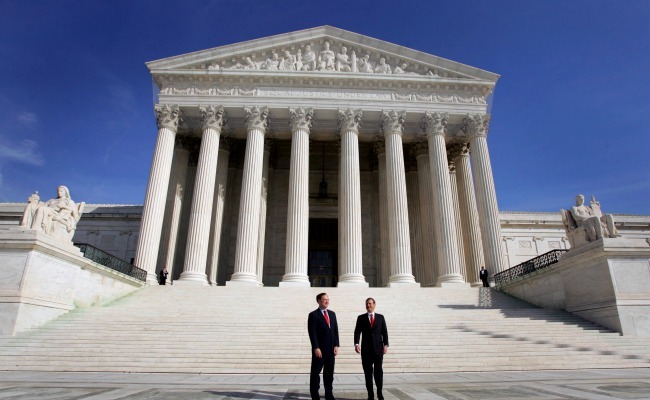 Though the 5-4 cases — like United States v. Windsor (the DOMA case) and National Federation of Independent Business v. Sebelius (the health-care case) garner the headlines — the Roberts Court is more harmonious than the rest of the government. Nearly half of its opinions last term were unanimous, the culmination of an upward trend from the last years of the Rehnquist Court. The justices may exchange sharp words in their opinions (and sarcastic looks on the bench), but they are great pals after hours, attending the opera or shooting large game animals in bipartisan packs. The Court is the branch that works. So the justices will probably be feeling good as they put on their robes. But maybe they shouldn’t be high-fiving behind the velvet curtain. In fact, they might want to look in the mirror and wonder what part they have played in the train wreck that is 21st-century American democracy. It’s not a small one. These reflections were spurred by a report in The New York Times that outside groups like the Club for Growth are using their massive wealth to threaten Republican members of Congress who dare hint at a compromise to avert shutdown and default. A number of House members know that the boat is about to go over the falls, but if they try to stop it, far-right individuals and groups will turn on them. These members must avoid a primary challenge at any cost. But they don’t need to worry about voter backlash, even if they wreck the economy and the nation’s credit. That’s because scientific gerrymandering of House districts has made them all but immune to defeat by a Democratic opponent. In the 2012 election nationwide, Democratic candidates won a plurality of the vote, 48.8 percent to 48.47. But clever districting produced a Republican majority of 234-201 — nearly 54 percent of the seats. In many districts, voters have no real choice. Red-state Republican senators who fear popular disgust — from, say, Latinos reacting to their resistance to immigration reform — have another line of defense: 18 states have passed vote-suppression measures since 2011. In close elections, just keeping one or two percent of the voters at home can make all the difference. In other words, American democracy is breaking down. It’s war to the knife between the parties. In this spectacle of decay, the Court’s hands aren’t clean. Over the past two decades, a series of silly and impractical decisions, taken together, have helped clog the arteries of our political system. If that system suffers a catastrophic infarction next month, the Court must shoulder part of the blame. Take polarization. Here is what may be the worst prophecy ever to appear in the United States Reports: "As for the case at hand, if properly managed by the District Court, it appears to us highly unlikely to occupy any substantial amount of petitioner's time." Those words appeared in Justice John Paul Stevens’s opinion for the Court in the 1997 case of Clinton v. Jones, in which President Bill Clinton asked the Court to stay a sexual-harassment lawsuit brought against him by Paula Jones. He did not ask for dismissal, just a delay until after he left office, arguing that having to respond to civil actions would distract him from his duties. Pish-tush, replied the justices. The result was the first impeachment and trial of a sitting president in more than a century. No single event has done more to foul the atmosphere of today’s politics. Two years later, the five-justice conservative majority awarded the White House to George W. Bush, who systematically deepened political division in his years as president. "Get over it!" Justice Antonin Scalia likes to say when citizens question Bush v. Gore. Why should they? The nation hasn’t gotten over Bush; we’re not even close. The gerrymander of 2010 flowed directly from a 2004 case where the Court considered Pennsylvania's carefully orchestrated, computer-driven redistricting — a partisan coup openly designed to maximize Republican gains. The same five who picked Bush threw the redistricting plaintiffs out of court. Scalia wrote for four of the five, "'Fairness' does not seem to us a judicially manageable standard." As for the Court's role in dark money, I don’t need to say much. Since Citizens United v. Federal Election Commission in 2009, the Court has been at war with any effort to limit the political influence of the rich. Finally, the ballot wars across the country owe much to the Court’s crabbed concept of democracy. In the 2008 case of Crawford v. Marion Co. Election Board, the Court told Indiana to go full-speed-ahead in a partisan voter-ID law aimed at imaginary fraud. "The record contains no evidence of any such fraud actually occurring in Indiana at any time in its history," Stevens breezily wrote. But he upheld the law because some fraud had occurred in New York City — in 1868. Then, in June, the five conservative justices decided that Southern racism is a thing of the past, and that Southern states must be allowed to impose new ballot regulations without the pre-clearance mandated by the Voting Rights Act of 1965. The law had been reauthorized with near unanimity by a huge bipartisan majority and signed by George W. Bush. But the majority disagreed: "Our country has changed." As a result, Southern states are erecting powerful new obstacles between minority voters and the ballot. So when we lament polarization, the declining respect for democracy, the bitterness of the national dialogue, the dominance of money in politics, and the life-and-death struggle over the right to vote, we are lamenting trends either born in or enabled by the Supreme Court. The Court isn't the cause of our current crisis. But the justices are not immune from the zombie epidemic; indeed, the Court may actually be a carrier of the plague.